In the previous tutorial, we have made RTC clock using DS3231 and ESP32. To minimize hardware requirements we will make Internet clock without using RTC module. This is more accurate as compare to RTC clock. ESP32 is a Wi-Fi module and can be easily connected to the internet so we will use NTP (Network Time Protocol) and UDP (User Datagram Protocol) to fetch Time from the internet using Wi-Fi. This Internet clock can be very useful while building IoT Projects. Network Time Protocol (NTP) is a networking protocol used for synchronization of time between systems a0nd Data networks. The NTP framework depends on Internet Time servers. NTP has algorithms to precisely adjust the time of day. NTP servers have software which send the clock's time of day to client computers using UDPport 123. So here in this project, we are getting time from NTP server using ESP32 and showing it on OLED display. You can also use ESP12 for this project, learn here to use ESP12. We will use Arduino IDE to write our program as explained in above article. 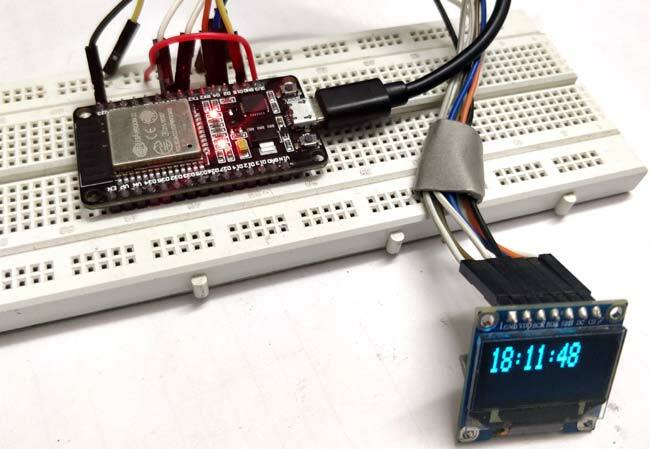 The complete code for ESP32 Internet Clock is given at the end of the article. Here we are explaining few important parts of code. So we have included all the libraries and defined variable for entering Wi-Fi name and password. Here NTPClient.h library is used to connect with the time server. It takes time from a NTP server and keep it in sync. And Hhre WiFiUdp.h library is used to send and receive UDP messages. UDP is a protocol which sends and receive short messages from our system to NTP server. So to get the time from Internet, we have to define three variables in our program for NTP. NTP_OFFSET which is the time zone of your country i.e. for India it is +5:30 hour. So it is 19800 in seconds. NTP_INTERVAL which is time interval taken by NTP to update time. It is 60-64 seconds. NTP_ADDRESS is the NTP server of your country. For India you can use “in.pool.ntp.org”. In setup Function, initialise Wi-Fi settings to connect with internet. Then initialize display functions to show time on OLED. In loop function, we have used timeClient.update(), this function take updated time from NTP in form of string and stores it in formattedTime variable. Then display it on OLED using display.println() function. display.setTextSize(2);                         // set these parameters according to your need..
Full program is given below. Now finally program ESP32 with Arduino IDE and your Internet Clock is ready to show time.